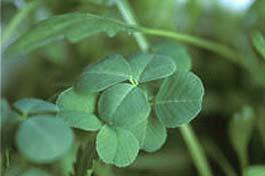 THE SHAMROCK AND THE COLOUR GREEN – NATIVE OR FOREIGN IMPORTS INTO IRISH ICONOGRAPHY? We are long accustomed to the association of these two symbols with Irish ethnicity and nationalism, the shamrock and the colour green, but historically can they be shown to be authentically Irish? The shamrock symbol has been used by a number of products and services, including Aer Lingus, formerly the Irish national airline and now a subsidiary of the International Airways Group1. Both as a plant and a living symbol it is now being sold on the streets and in shops in preparation for the celebration of the male patron saint of Ireland, St. Patrick on March 17th. St. Patrick himself was a foreign import, albeit one seized unwillingly by Irish raiders. The son of a Romanised Celt it seems and probably from Wales, Patricius was kept as slave labour herding pigs until his escape but he returned as a Christian missionary and became one of the founders of the Celtic Christian Church in Ireland. We may view this as an amazing feat in itself – Ireland was one of the few European countries which went from the old multi-gods religion to the monotheism of Judeo-Christianity in a largely peaceful transition. However the Celtic Church at least tolerated and many would say condoned many of the laws and customs of the old culture, including marriage of priests, the right to divorce by men or women and a higher status for women than was common in an increasingly feudal Europe. The word “shamrock” is an Anglic corruption of the Irish seamróg, itself a contraction of seamair óg, meaning a sprig of young — or more likely small –clover. The Irish shamrock is usually the species Trifolium dubium (lesser clover; Irish: seamair bhuí), with yellow flowers or the white-flowered Trifolium repens (white clover; Irish: seamair bhán). Children at schools influenced by the Catholic clergy in Ireland (which was and still is in control of the vast majority of the schools within the Irish state) were taught that St. Patrick used the shamrock to illustrate the existence of the Christian Holy Trinity of the Father, Jesus Christ and the Holy Ghost, i.e. explaining how there may be three different aspects in one entity, as in the three leaves on the one stem of the shamrock. A charming story but clearly without any foundation whatsoever – not only is it not mentioned in what is believed by historians to be Patrick’s autobiography but the story only emerged much later. However, the crucial case against the veracity of the story is that neither the Gaels nor the Celts in general2 had any need to be convinced of the existence of trinities of gods: in Ireland we already had the Morrigan, a female trinity of Badhb, Macha and Anand and of course the Celts had the ubiquitous triskele symbol (surviving as the national sympol of Manx) to illustrate a trinity, religious or otherwise. The first clear association of the shamrock with St. Patrick in Ireland comes in an account by an English traveller to occupied Ireland, Thomas Dineley, who described in 1681 Irish people on St. Patrick’s Day wearing green on their clothes, including the shamrock. But the first account of St. Patrick’s use of the shamrock is not seen until 1726, when it appears in a work by Caleb Threlkeld, a botanist. But what of the colour green? Surely that at least is authentically Irish? Well, it certainly has a longer pedigree. Dineley’s account in 1681 associates wearing green with the celebration of the feast day of St. Patrick’s, one of the three patron saints of Ireland3 (yet another trinity?). But the Catholic Confederacy of 1642-1652, an alliance of Gaelic chieftains with Norman-Irish aristocracy against the Reformation being imposed upon them, also flew a green flag, with a gold harp upon it. The symbol of Ulster was the Red Hand from an ancient Irish myth of arrival but what was the backrgound? Both the O’Neills and O’Donnells, dominant clans of Ulster, have designs in red and blue against a white background. Only Leinster province has a design in green and yellow. The colour of an old design for Meath is blue. There is an old heraldic design for Ireland of three crowns on a blue background and although this was the arms granted by Richard II of England to Robert de Vere as Lord of Ireland in 13864, over two centuries after the Norman invasion, it may have drawn on the colour of an existing Irish flag or design. The designers of the Cumann na mBan flag may have been aware of the ancient claim of the colour blue when they made that the background colour of their own flag. Markievicz and Hobson would even more likely have been aware of it as well as the blue with an orange, golden or silver sunburst, alleged flag of the legendary band of warriors na Fianna, when they made that the flag of the Republican Youth organisation they founded, Na Fianna Éireann. But what about the United Irishmen’s flag of green, with a golden harp? When talking about the United Irishmen we need to remember from where they received their ideological influences. These were mostly from radical and republican thinkers and agitators in Britain, the USA and France. The United Irishmen organisation was founded by Anglicans and Presbyterians, mostly colonists and settlers or their descendants and most of their leadership in the uprisings of 1798 and 18035 came from from among that section of Irish society. That goes a long way to explaining why most of the revolutionary texts of the time are in the English language, in a country where the majority even then still spoke Irish and with a rich literary and oral tradition in the Irish language. 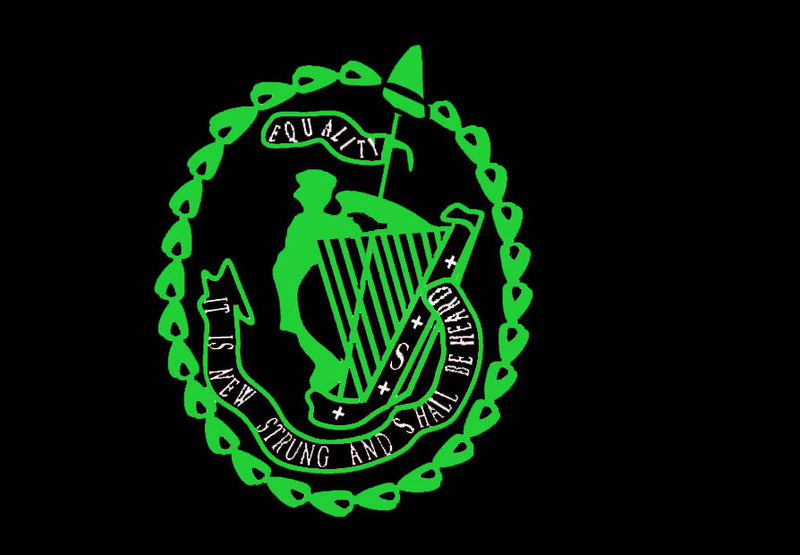 United Irishmen harp motif with motto. There is a historical trend among colonists to feel disadvantaged with regard to their compatriots back in “the mother country”, to resent levels of taxation, to complain of inadequate representation and of corrupt or inefficient government. This occurred in English-speaking America and led to the American Revolution and the creation of the United States. It also occurred in the other America, where the Spanish-speaking colones developed conflicts with the Spanish Kingdom and eventually rose in rebellion against it across South and Central America, eventually gaining independence for a number of states. A similar process was taking place in Ireland, where the disaffected who belonged to the established church, the Anglican or Church of Ireland, understood that to create a strong autonomous nation, even as part of the English-ruled unity of nations, they would need to bring into government the greater majority, the Presbyterians6 and even the overwhelming majority, the Catholics (i.e the native Irish). Henry Grattan attempted this by trying to get the excluded denominations admitted to the Irish Parliament but Crown bribery, sectarianism or fear of having to return lands grabbed by their grandparents or others, combined to have a majority vote the proposals down. That ensured that the organisers of the United Irishmen would realise that no progress to their objectives was possible without revolution. Irish nationalists among the descendants of colonists often adopted Irish symbols and some other Irish identifiers as a sign of difference from the English. There was some interest in the Irish language but it does not appear to have been widely studied by most Irish Republicans of the time as witnessed by the incorrect appellation of “Erin” for Ireland – any Irish-speaker would know that Éire is the nominative form for the country and ‘Éireann’ is employed in the genitive and dative cases. United Irishmen were involved in organising the Belfast Harp Festival of 1792, while folk-song collectors and antiquarians dug among the people and archives for survivals of an older Irish culture. The Harp, an ancient Irish musical instrument employed also to accompany poetry recitation was employed as a symbol by the Unitedmen — often with the motto “ ‘Tis new-strung and shall be heard”. In addition, the English had long recognised the instrument as a symbol for Ireland, albeit under the Crown. But where did the colour green come from to be associated with Irish nationalism? This question could do with more research than I have the time or other facilities to devote to it but one may comment what green is not: it is neither the Red of Royal England nor the Blue of Royal France. Nor is it the red with a white salterre of the Order of St. Patrick, another colonial creation and clearly of Royal and colonial origin and patronage, created at the time of a bubbling of the nationalist pot in Ireland and only sixteen years before the 1798 Uprising. 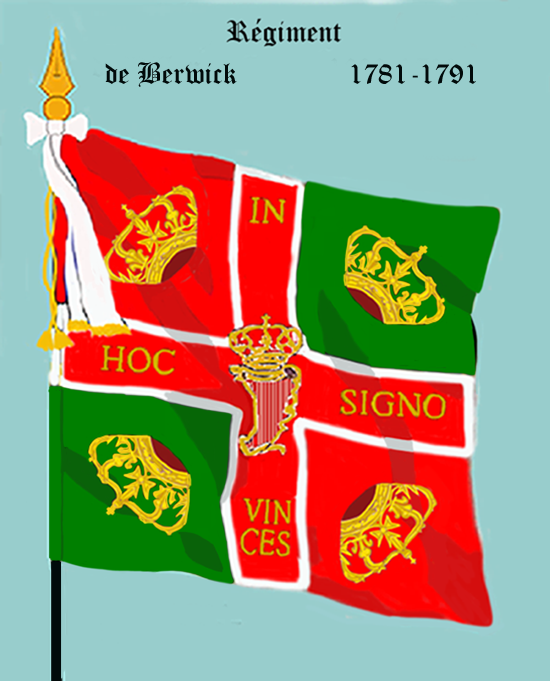 Interestingly, the Irish Brigade (1688–1791) of the French Army did include the colour green in its flag design, four quarters alternately green and red, with a crown in each. And the standard of Napoleon’s La Légion Irlandaise in 1841is described as of “emerald green”. The trinity there is clearly the political one desired by the Unitedmen of Protestant (Anglican), Catholic and Dissenter (Presbyterian and other sects). 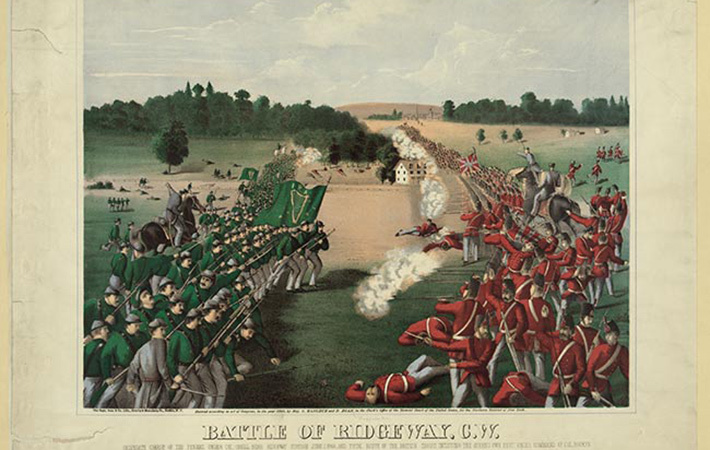 Green was widely worn by people with United Irish sympathies and particularly during repression by Orange militia, people wearing green were targeted. However, if one wanted to wear a suspect nationalist colour, how safer than to do so than on the feast day of the alleged founder of Christianity in Ireland and acknowledged by Protestant, Sects and Catholics alike? From the United Irishmen onwards, green has been unarguably associated with Irish nationalism and Irish Republicanism, in the flags of the Fenians, the Irish Volunteers and even of the Irish Citizen Army, also part of the tricolour flag awarded by Parisian revolutionary women to the Young Irelanders which is now the national flag of the Irish state. Green was also the colour of the St. Patrick’s Battalion that fought for Mexico against the invasion by the USA (1846-’48) and of ceremonial uniforms of some Irish formations during the American Civil War and the main colour of some of their regimental flags, also of the flags of the Fenian veterans of that war invading Canada in 1866. 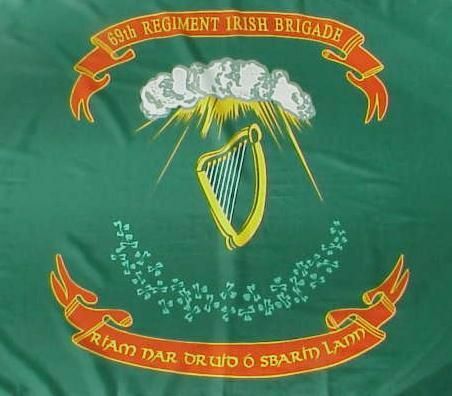 Flag of the Irish Brigade (later the Fighting 69th) in the Union Army, American Civil War. Does it matter whether green is authentically an ancient Irish colour or not? Would Irish Republicanism or nationalism be de-legitimised if it could be proven the colour they are using was of dubious origin or of comparatively recent political significance for Ireland? I don’t think so. But it is good to be aware of the different origins of symbols and to question and even challenge what is handed to us as unquestionably authentic. However, enough people have now fought under the green in eight uprisings in Ireland and struggles abroad; enough people have laid down their lives under the colour and indeed, once it became a symbol of Irishness, enough Irish have been persecuted, prosecuted and even executed for wearing it, to ensure that “wherever green is worn” can be Irish. And in that representation, the shamrock too, which of course happens to be green, and could be passed off as a devotional symbol to suspicious authorities and murderously insecure and sectarian minorities of colonial origin, has its place. (by John Keegan “Leo” Casey (1846 – March 17, 1870). Keegan, known as the Poet of the Fenians, was an Irish poet, orator and republican who was famous for authorship of this song, apparently written when he was 15 and also as the writer of the song “The Rising of the Moon” (to the same air), also as one of the central figures in the Fenian Rising of 1867. He was imprisoned by the English and by a huge irony died on St. Patrick’s Day in 1870 at the age of 24). Where rich and poor stand equal, in the light of Freedom’s day! O Erin! must we leave you driven by the tyrant’s hand! But where, thank God! we’ll live and die, still Wearing of the Green! 1A consortium of Iberia, Vueling and ironically, British Airways. 5 And even many of the leaders, journalists and poets of the Young Irelanders and of the Fenians. 6And other “Dissenters” such as Unitarians, Methodists, Society of Friends (Quakers) etc. 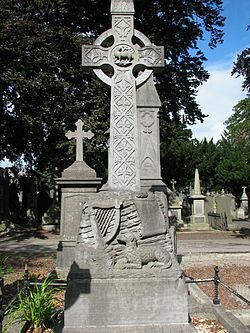 7Napper Tandy was a United Irishman who lived in Dublin; his home is mentioned in the most common versions of the well-known Dublin song, The Spanish Lady. This entry was posted in Cultural Comment, Current Affairs Comment, Flora, Folk Custom, History, Ireland, irish history, Irish Republicanism, La Diáspora Irlandesa, National Liberation, Plants, social commentary, Song, Traditions & Folk Custom and tagged Anti-imperialism, Irish history, Irish political song, Irish Republicans, social commentary, songs of struggle. Bookmark the permalink.